Our step-by-step series will take you through the entire home-buying process — from finding a buyer’s agent to settlement day, and all the details in between. Every first-time buyer will find this information-packed series easy to follow and understand. Make sure to tune in for the next few weeks! 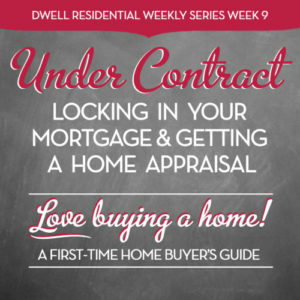 Once you’re under contract to buy a home, you want the final stages of the mortgage process to go smoothly – you don’t want anything to sidetrack the sale from here on out! Nothing is a done deal yet even when you’re under contract. Both your future home’s appraisal and your ability to lock in a good mortgage rate can affect the outcome of your purchase. Why do you need an appraisal now? Your appraisal is the bank’s way to make sure the home you’re buying will sell for at least the amount of money it’s going to lend you. Your lender has already approved YOU and your finances but now it’s got to approve the home you’re about to buy. It wants to make sure that this is a sound investment in case you default on the loan. If the property appraises lower than the sales price, the loan might be declined. statements on any issues that may hurt the property’s value, such as structural damage or even if the property took too long to sell. Don’t confuse an appraisal with a home inspection! Appraisers are not home inspectors so don’t rely on them to determine if your home is in good condition. They don’t look for leaky roofs, test appliances, or any other items found on an inspection check-list. What exactly is a lock-in? A lock-in is a lender’s promise to hold a certain interest rate and a certain number of points for you, usually for a specified period of time (typically 30 or 60 days), while your loan application is processed. It’ll protect you against any rate increases during the loan process. However, rates may drop after you lock in and prevent you for taking advantage of any decreases during this period. So tread carefully! When you first look for a lender to get pre-approved make sure you find one with a favorable rate, the lowest points, and other upfront charges such as a lock-in fee. This fee may or may not be refundable depending on the lender. Some lenders have a “float down,” whereby if your rate lowers more than a certain amount within a short time before settlement, you get the lower rate for no charge. However, YOU have to be the one to ask if your lending institution offers this option, AND be the one to keep track. Ask your lender upfront about what the criteria is to get the lower rate if rates fall before your settlement or refinance. Discuss the interest rate outlook with your lender. Will rates rise or dip in the coming days or weeks? Also determine how the ups and downs in interest rate quotes will affect your mortgage payment and your ability to qualify. What are you willing to do? Determine the lock-in period with your lender and have them estimate the time needed to process your loan. The lock-in period should be long enough to allow for settlement and any other contingencies imposed by the lender. Make sure you factor in any possible delays (construction issues, appraisal inspections, etc.). Lock-ins of 30 to 60 days are common but some may range from seven to 120 days. Usually, the longer the lock-in period, the greater the fee. Have a tangible record of your arrangements with the lender in the event of a dispute. Make sure you have a written rather than verbal lock-in agreement. You MUST fully understand your lender’s lock-in rules and procedures. It’s best to obtain a blank copy of a lender’s lock-in form to read before you apply for a loan. If possible, show the lock-in form to a lawyer or real estate professional. If your lock-in period expires, you could lose the interest rate. In this situation, most lenders will offer you a loan based on the prevailing interest rate and points, which may now be higher due to market conditions. Sometimes, though, the rates are lower. If the delay is the lender’s fault such as heavy demand, the lock-in period may be extended; and sometimes it may be extended even if it is your fault. Again, check the lock-in rules. There you have it—what needs to happen right after you go under contract. Join us next week for How to Navigate a Home Inspection, the tenth article of our Love Buying a Home series. You don’t want any surprises after you move in, right?! Here’s the breakdown of what to expect during your home inspection and what to do if any red flags arise.